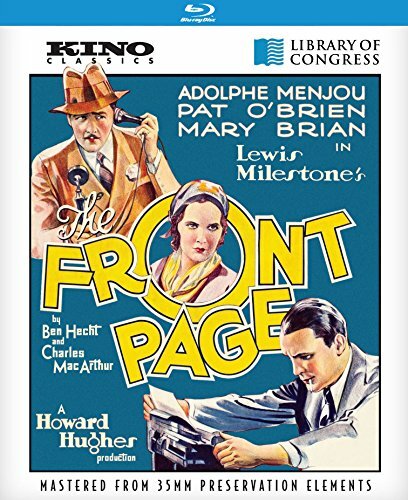 NEW YORK, NY - JULY 16, 2015 - Kino Lorber proudly announces the Blu-ray and DVD release of The Front Page , Ben Hecht and Charles MacArthur's hardboiled satire of the newspaper world about an ace reporter who wants to quit the business to settle down and marry his girlfriend, and his opportunistic editor who will go to any lengths to get him to stay. Based on the hit 1928 Broadway play, and twice remade (by Howard Hawks in 1940 as His Girl Friday, and by Billy Wilder in 1974), this fast-paced farce was the prototype for the classic screwball comedies to follow. Directed by Academy Award-winning filmmaker Lewis Milestone (All Quiet on the Western Front) and produced by Howard Hughes (Hell's Angels, Scarface), The Front Page is also a landmark early sound film and a classic of the Pre-Code era, packed with risque humor and dialogue. Based on the wildly successful (and controversial) play by Ben Hecht and Charles MacArthur, The Front Page follows hard-boiled crime reporter Hildy Johnson (Pat O'Brien) who has vowed to quit the business and marry his new sweetheart (Mary Brian). 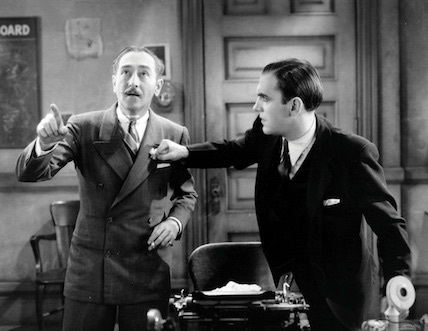 But when a political radical (George E. Stone) escapes from custody on the eve of his hanging, the reporter's room is plunged into comedic chaos, and Hildy's brash editor (Menjou) sees it as an opportunity to manipulate the reporter into staying. Raucous, irreverent, and remarkably funny, The Front Page is a landmark in cinema history - a brilliantly orchestrated, high-speed satire that set the standard for the countless screwball comedies that followed in its wake. 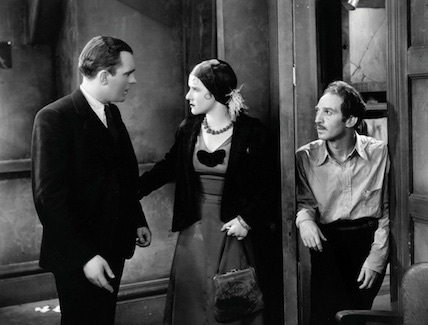 But few films can match the risqu� flavor and the relentless pace of the masterpiece that spawned an entire genre, earning Academy Award nominations for Best Picture, Best Actor (Adolphe Menjou), and Best Director (Lewis Milestone), as well as a spot on the esteemed National Film Registry.